Year 2016 is in full effect now, however Forex experts are still evaluating how we did last year. Today, we are proud to announce that one of the major websites in the industry favoured its recognition of OctaFX: we are proclaimed Best International Broker 2015 by FX Empire! OctaFX was voted Best in the category by the majority of traders around the world, and we are excited to be rated so high on the international scene. FX Empire Awards is a yearly competition where traders vote for their favourite brokers. In 2015, more than 10,000 traders marked off the best brokers in 10 categories. We were nominated as Best International Broker 2015 alongside with Exness, Plus500, FxPro, and this category nominees were voted for by traders who use the industry services every day. We are proud to admit OctaFX won with 46% of votes! Best International Broker award praises localization of trading services as well as general offering, service and global appeal. FX Empire awards are taken seriously by industry players, and especially by the traders themselves, who perceive the awards as a real endorsement of the trust and quality they can expect from the brokers. With the help of FX Empire, new traders can easily find the ideal brokerage service provider that will suit all their needs. Read full OctaFX review at www.FXEmpire.com by following this link. If you are already happy with your trading experience with OctaFX, feel free to leave a your review review on our services. 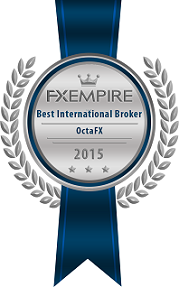 Open an account with OctaFX: your Best International Broker 2015!